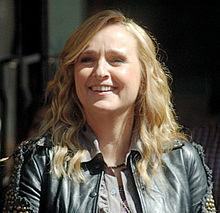 Melissa Etheridge (born May 29, 1961) is an American singer and musician. Her songs include "Come to my Window" and "I'm the Only One". Etheridge was born in Leavenworth, Kansas. She has fifteen Grammy Award nominations. She has won two Grammy Awards. Etheridge won the Academy Award for Best Original Song for the song "I Need to Wake Up". That song was from the movie An Inconvenient Truth. Etheridge came out as lesbian in January 1993. She was diagnosed with breast cancer in October 2004 and has recovered. This page was last changed on 13 June 2018, at 02:03.